Would you go out tonight for the start of World Pride, but haven't got a stitch to wear? Luckily for you, a slew of Toronto's indie retailers and designers have chosen to capitalize on the fever-pitch excitement leading up to this year's blowout Pride, creating commemorative pieces that are as stylish as they are souvenir-worthy. In addition to hosting more than a few Pride parties, the Drake Hotel's retail apparatus is getting in on the fun with a pair of commemorative tees. One's a collaboration with 1 LOVE T.O. (who make their share of cute Pride-appropriate gear), but I'm partial to the rainbow-stripe maple leaf design, which handily reuses a design they created earlier this year to support LGBT athletes in the Sochi winter games. Find the 1 LOVE T.O shirt for $42 and the tank for $38 at Drake General Store locations around Toronto, or the Drake's pop-up at Hudson's Bay (44 Bloor St. East). May28th designer Agni Tilla never shies away from colour and print in her line of fun plastic watches, so it stands to reason that the company would hop on the rainbow-painted bandwagon. Their Pride watch is available in a rainbow of fruit flavours. They're $38 at the Brika pop-up shop (Hudson's Bay, 44 Bloor St. East), or stop by their studio (198 Walnut Ave.) for a slew of other options. 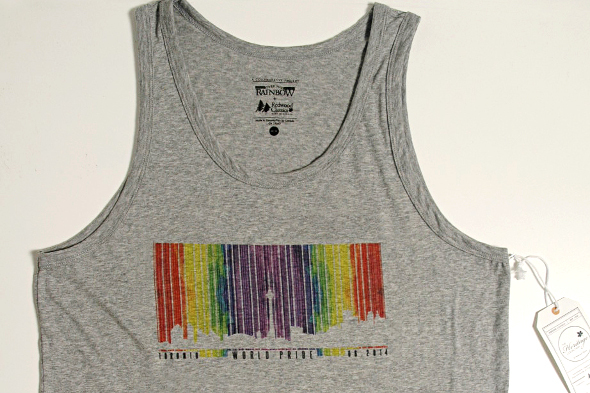 The incredibly aptly-named Over The Rainbow, a perennial Yorkville source for designer denim, teamed up with local apparel company Redwood Classics to create this Pride-inspired design. The barcode-style design is meant to serve as "Toronto's own Pride time stamp", but it looks kind of sporty - like a logo for the best marathon ever. All the proceeds from the tees ($38) and tank tops ($32) will benefit Fife House. Find them at Over The Rainbow (101 Yorkville Ave.). 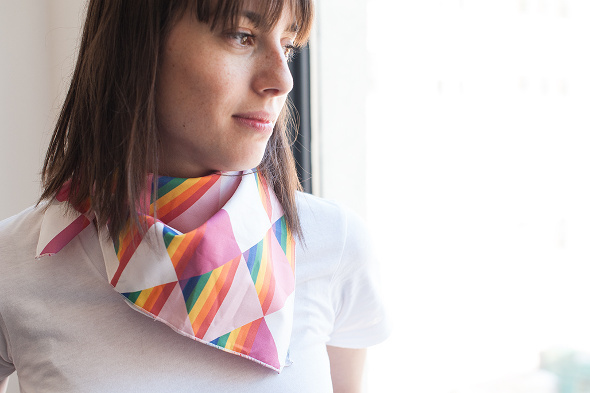 From Toronto textile designer Avril Loreti comes this festive pink-and-rainbow tiled bandana, which will clearly signal to all your fellow Pride-goers that you really, really love Canadian handicrafts. Bonus: It's also available as a tea towel. Fancy! It's $24 at the Brika pop-up shop (Hudson's Bay, 44 Bloor St. East). Nicole Tarasick is a fixture at Toronto craft fairs and design stores, thanks to her line of instantly-recognizable minimalist throw pillows and totes; this time, she's getting topical with World Pride tote bags in pink and black. Perfect for hauling your Pride parade essentials: water bottle, sunscreen, rainbow flag, and however many layers of clothing you decide to ditch. It's $24 at the Brika pop-up shop (Hudson's Bay, 44 Bloor St. East).